The New Real Book Vol. 1 - C Edition by Various. For C instrument. The only legal, corrected and updated version of the original Real Book. Now available in C, Bb, and Eb. All living composers have approved these charts; many of them are from the composer's own lead sheets. Charts for the standards were derived from a co. Jazz and Pop. Difficulty: easy-medium to medium. Fakebook (spiral bound). Melody, chord names, introductory text and black & white photos. 438 pages. Published by Sher Music Company. With melody, chord names, introductory text and black & white photos. Jazz and Pop. 9x12 inches. Jazz classics, choice standards, pop-fusion classics! The only legal, corrected and updated version of the original Real Book. Now available in C, Bb, and Eb. All living composers have approved these charts; many of them are from the composer's own lead sheets. Charts for the standards were derived from a consensus of the best recorded jazz versions. Created by musicians, for musicians. The new standard in fake books! 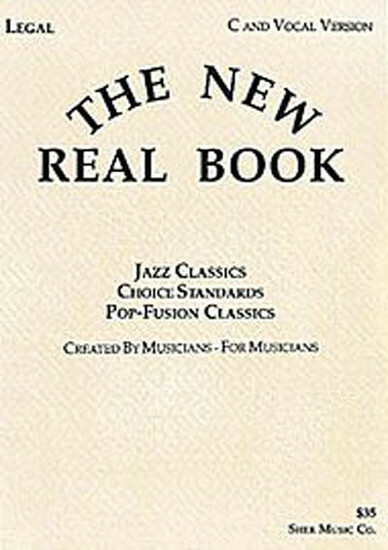 An invaluable volume used by thousands of aspiring jazz musicians. This volume contains clearly written and accurately transcribed lead sheets for hundreds of jazz classics. A must have for every serious student of jazz harmony and composition. Book was as advertised and I received very quickly after ordering.